I decided to try my hand at making bunny rolls for Easter. 1) Buy frozen rolls. The kind that come in little balls. 2) Set them out to rise. This normally takes 2 - 4 hours. Read the bag for better instructions. Being the awesome chef that I am, I had no idea it took so long when I started. At 10pm the night before Easter. 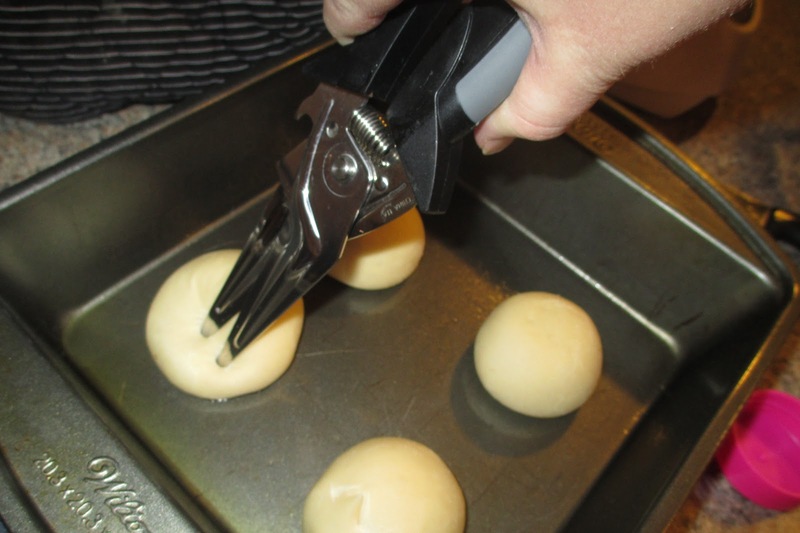 3) Once they have risen sufficiently (usually twice their original size), take kitchen shears (scissors will suffice), and cut bunny ears into the dough. Cut bigger than the pictures I'm showing you or you'll end up with kitty rolls instead of bunny rolls. Trust me. 4) Bake the rolls as per instructions on bag. 5) Take them out & let cool. 6) Poke "eyes" in each roll. I'll try another batch and see if I can get the ears sized more appropriately. Will post if I manage it. While I still think they're adorable, I do think these look more like cats than bunnies. On to try again next time! Cute! They look like the Pikachu thing from Pokemon. Cute, anyway! Gotta' hand it to you for trying.